(L&G) + (NYC x Design) = NEW EXCITEMENT! L&G is proud to introduce two entirely new collections debuting at the upcoming NYC x Design week starting May 17-20th. MIRAGE- A collection of optic-bending furniture from shelves to tables. MARU- A collection of lighting and accessories that explores the functional and aesthetic versatility of mix materials in all types of circular forms. For the past month, we've been practically running on non-stop adrenaline straddling between excitement, caffeine, and sleep deprivation while gearing up to launch 2 collections, 7 new products, at 5 venues during NYC x Design 2013! Here are the list of events that we'll be part of! 1. NOHO NEXT 2013 (we will be there, so come say hello!) @ Subculture, 45 Bleecker Street; May 17–20, 12pm to 7pm. Dylan & I will be there in person while exhibiting our brand new collections Mirage & Maru- a series of work from furniture, lighting, to small home accessories. 2. AmDC’s TROPHY @ Underground at The Standard, East Village Hotel, 25 Cooper Square; May 17–20 / 12pm to 7pm. We'll be exhibiting our special mirage shelves. 3. RECLAIM x 2 @ 446 Broadway, 3rd Floor; Thursday, May 16, 2013 / 7pm- 11pm. We've donated special one-off editions of L&G wind chimes made in collaboration with artist Nicholas Nyland for Reclaim's second charity sale. 4. STDARD SOCKET @ Wanted Design- 269 11th Avenue; May 18th-20th / 10am-7pm. Our ‘Full Turn’ lighting will be displayed as part of Standard Socket’s inaugural lighting collection. 5. STORY @ 144 10th Ave; May 1st-May 30th / 11-7pm. We're part of STORY's ever changing retail concept store offering some small gift & home goods at their current [DESIGN] theme popup shop. New Cake Servers on BHLDN & Terrain! But this last winter out of the blue, one of the the buyers from Terrain (with great home & garden goods) contacted us about making custom servers for them! Then a month later, another buyer from BHLDN (with beautiful wedding things of all sorts) contacted us about making more custom cake servers, too! Not only are both of these shops great, they're also under the same umbrella of Anthro & Urban Outfitters! We feel like we're just one step away from getting something in Anthropologie! Let's hope that next step will happen in the near future! Every year, we tell ourselves that we need to prepare early since this is always our busiest time of the year. But of course, no matter how much we think we prepared ourselves....we still end up working late hours and feeling sleep deprived for the majority of the time. ....And this holiday especially seemed extra actioned packed. We're totally stoked to get orders from some of our favorite shops from all over! The Cool Hunter's pop-up in Australia / Douglas + Bec in New Zealand / Makers & Brothers in Ireland / April & May in The Netherlands / Le Kiosk in Sweden / Die Sellerie in Austria / The Drake General Store in Toronto / Nineteenten in Vancouver / The Future Perfect , Sight Unseen, and American Design Club in New York / Unison Home in Chicago / Terrain in Philadelphia / Propeller in San Francisco / Woonwinkel in Portland / Frye Art Museum Shop in Seattle! Besides cranking out orders for all those awesome stores, we also couldn't help ourselves from other fun happenings/events in Seattle! Here are some photo documentation below taken from our Instagram. We made a fun lookbook along with our Seattle friends from Grain and Iacoli & McAllister. We did a Himmeli ornament workshop at the Meet The Makers event at the Frye. We designed and made our own special L&G letterhead that folds into an envelope! And finally, we organized and put together The BLAK design popup the last weekend before Christmas at Caffe Vita! There's still so much I need to blog about, but needless to say, we're just happy that we made it through the holidays! Now it's time to unwindulax! In celebrating the early winter dark hours, Brite collective presents THE BLAK\designmart!! A 2-day only holiday sale featuring 30+ emerging designer/makers presenting limited edition BLAK products under the theme of black to celebrate the early winter nights! In addition, a separate open designmart where more designers will be there to represent and sell their own work outside the theme. ALSO We're excited to share that this event will help support the new non-profit design organization, Seattle Design Foundation. SDF's mission is to create a platform for local creatives, in both social and financial capacities. Come meet the designers and enjoys special BLAK drinks, snacks, & treats! &c. / Aaron Murray / Aleks Pollner / Ampersand As Apostrophe / Ample / Blk Pine workshop / Brakish / Bultman Ceramics / Cassie Hibbert Design / Christianna Shaw / Erin Kendig / Fleet Objects / Free Time Industries / fruitsuper / Glasswing / Grain / HighLow Jewelry /Irene Wood / Jessalin Beautler / Kaleidoscope Vision / Kate Greiner / Kimberly Baker / Ladies & Gentlemen Studio / Maiden Noir / Maudern /Metrode / Mimot / Neon Noble / Nicholas Nyland / Noal Nyland / OBJECT / OUI / Ozen Company / Piano Nobile / Ria Leigh / R&L Goods / Sarah Loertscher / Studio Arno / Ta+ma / Tanya Aguiniga / Urbancase / VonTundra /Zero Sept...and MORE!!! FEEL FREE TO SHARE THIS with anyone & everyone! THANKS!! L&G and Anthology getting festive! Anthology just launched their lovely online Holiday issue and we're excited to be one of the contributers for them for the first time!! For this issue, Meg (the editor) asked us to make a special holiday wreath for the "Holiday Hang Ups!" (pg 43) section featuring various handmade wreaths! I never make one before and thought "OK, why not!" My vision was to make something that's simple, not too holiday-ey but still warm & cozy all at the same time. I was a bit worried that it would look too boring....but thanks to Anthology team who styled & shot everything so well that they made it feel extra nice & festive! Check out the rest of the Holiday issue and get in on the festivities! HELP L&G with your VOTE! L&G Nation! HELP us win a trip around the world by VOTING OUR VIDEO we made for Travelocity's Great Gnome Nabbing! You can help us travel to places where we'll study and learn cool crafts around the world and share them with everyone! Everyone can get ONE VOTE per DEVICE, per DAY.... so VOTE as often as you can and help spread the word! We will forever be greatful with all your support!! .....This is happening in 8 days! Go to our FB EVENT page for more info & invite everyone! The Value Shop is a 3-day desing popup shop which will feature 17+ local Seattle studios. Our mission is to bring together all the great Seattle design studios by not only highlighting the products, but also share each a bit more about studio's approach, process, and way of designing. Hopefully the weather will look just like this dream rendering! We're SOOOOO very excited to share our very first lookbook! We simply can't wait to share this 70 page lookbook with y'all through the magic of the world wide web! Launching Natural Selection has been a total learning experience for us. It challenged us in so many great ways and also lead us to so many wonderful opportunities to collaborate with talented people we've admired. Besides this being first attempt in creating a furniture & lighting product line, it was also our first collaborative project with an artist, Ashley Helvey, our first time having a professional photographer like Charlie Schuck help us take fantastic studio shots, our first time showing at Noho Design District during NY Design Week, which then lead to our first feature in Surface Magazine! We couldn't be any happier with all the great responses we've been getting so far! We really hope that this can lead to some more exciting opportunities down the line! Natural Selection Lookbook Sneak Peek! We've been working long and hard....(mostly long) on putting together a lookbook for our Natural Selection collection we launched back in May during NY Design Week! The Natural Selection collection is very much about how we reinterpret the humility and warmth that nature provides. FINALLY Our bloc necklace lookbook! I'v been working on the necklaces here and there for some months now and is totally excited to finally launch this whole collection! We're super lucky to have our talented friends, Charlie Schuck who took the photos and Ashley Helvey who help us style our necklaces. It's amazing watching the pros work their magic...they got way better equpitment, way good at implementing their vision, way good at editing, and also just waaaaay faster!! I think they took all thos photos in less than 30 minutes! If it was ME taking the photos....it would take me at least 3 times as long where I'd end up with WAAAAAY too many photos of the same thing....which then leads to me squinting and stareing at all the photos as if I'm getting my eye exam, and me going...."this one? or this one? ok again.... this one? or this one?" In any case...check out these awesome photos! 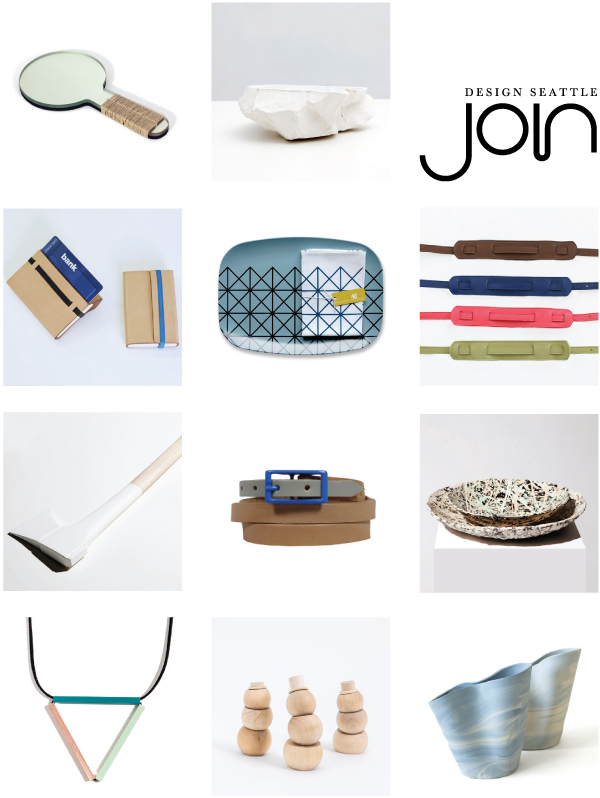 Dylan & I will be part of next weekend's Remodelista Market at Dwell on Design in LA, June 22-24th. Along with our other JOIN friends (Blk Pine Workshop, Grain, Fleet Objects, fruitsuper, Iacoli & McAllister, R&L goods), we'll all be selling our goods there! We will be bringing an array of goods such as our classic chalk piggy bank, homestead candlesticks, Salt & Pepper Pawz, our new Aura lights, and some brand new Perimeter Tray color comobos...like this one! We love how fresh and bold it looks & feels! We're so thankful that we got the help from our multi-talented friends! Charlie Schuck who took the photos, and Ashley who styled the shoot! So lots of exciting things will be happening around Dwell on Dwell! We're totally stoked! So if you happened to be in LA, come say hello and see our new work in person!! Check out everything that Monica & Jill (from Sight Unseen) did for Noho Design District including our Ovis Chair & Aura light at Zero + Maria Cornejo. It was seriously amazing to see all the shows, spaces, and works they coordinate and organized for the entire neighborhood of Noho during New York Design week. I don't know how they did it all...but my suspicion is that they just don't ever sleep. Yup. If you stare at our Nyth bowls long enough....you MIGHT be able to see some 3D dolphins....Give it at least 20 minutes. nooooo blinking! Perhaps we'll organize a staring contest at RAW+UNFILTERED opening! We love process shots and apparently so does Sight Unseen! They shared a nice post sharing some pics of our chairs in collaboration with Ashley for Noho Design District. We've been pretty active on posting our process almost daily on our tumblr & Instagram (jeanLGstudio), so you can see more there, too! Also the Sight Unseen post shows more sneak peak process shots of other talented friends from Iacoli & McAllister and Fort Standard... plus others talents we hope to meet like Caitlin Mociun, Makers & Brothers, Bec Brittain and more...more...more!!! Lots of exciting things are in the air for L&G....we're SOOOO excited to be officially part of this new online shop, Craft & Culture, that recently launched beginning of the year! The founders of C&C (Hana & Jason), also based in Seattle (yet another awesome point for Seattle!) has a vision to create a super well-curated platform featuring self-makers, designers and artists. They're starting off with talented local artists / designers like Meghann Sommers of &C, Ashley Helvey, Elizabeth Patterson and Actual Pain...and now added, US! We're so excited to be part of something as special as C&C. Both Hana & Jason have such a great eye and vision for the company... not only are they providing a platform for designers to sell their work, they also go an extra mile to capture the personality and work philosophy by interviewing the designers and photograph their space! They took all these amazing photos and we're just ecstatic with how nice and professional everything looks! C&C will be adding plenty more new and exciting national & international designers in the coming month, so stay tuned!